Simple, yet elegant, bridal shower decorating with rose petals makes quite a statement. Add a splash of natural color and a touch of fragrance to your party. Use them sparingly, or spread them throughout the room to tie your look together. You're guests will be impressed and the bride-to-be will love the idea. A unique way to dress up your event, they are available in an assortment of colors. You're sure to find some to go with your decor. They can be purchased fresh, freeze dried, or silk, so you can easily adapt them to your fit your plans. You'll also find they can fit into any budget. • Line the walkway for the guest of honor. She'll feel like she's walking the "Red Carpet". I f this is a surprise party, make a path indoors or on an outside patio. 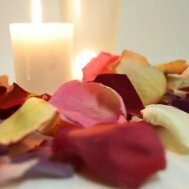 • Beau-coup.com is a great source for bridal shower decorating with rose petals. They have both freeze dried and silk, in a variety of colors. • What type of menu will you have? Use on the buffet table as a decoration to highlight each dish. If it's a sit-down meal put petals all the way down the center of a rectangular table, or in the center of a square or circle table. • Surround individual centerpieces with complimentary or contrasting colors for an elegant display. • Fill small baskets with petals in your party colors. Sit them around the room as accent pieces. • Put them in a glass bowl surrounding a floating candle. This can be used as an elegant centerpiece. • Outline appetizer dishes as they are being served. • Fill sheer bags or small boxes, and use as party favors for your guests. Mix and match colors for a festive touch. • Freeze dried petals are all natural and biodegradable, making them 100% earth-friendly. These are a great choice for any outdoor event. • Place on the floor around the guest-of-honor's chair, as an extra special touch. • Go to bridal shower decorating ideas page. 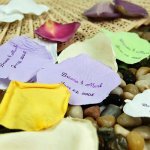 • Return from rose petal decorations to Bridal Shower Ideas for You homepage.